The market rally continues, with many stocks breaking out. There were 229 new 52 week highs in my universe of 4,000 stocks on Monday. The following stocks at new highs were near multi-year highs and had triple digit earnings increases in their most recent quarter: SAN, CTXS, PPO, CMI, OPEN, HWK, BIDU, ALK. I own some of these. The new high list is a great place to look for promising growth stocks. 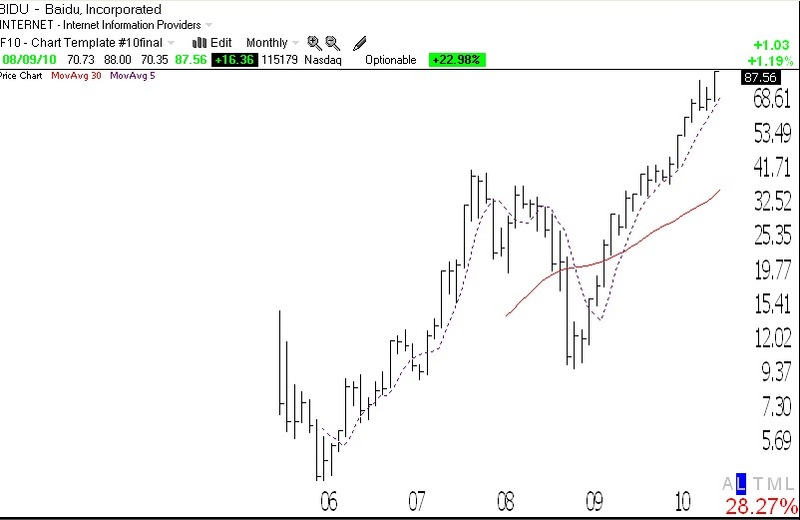 Check out this monthly chart of BIDU, (click on chart to enlarge), a true rocket stock. Futures very weak–top of right shoulder complete?